RATES: $16 to $24, the latter being for sites with electric hookups. Interagency pass holders get a 50% discount. 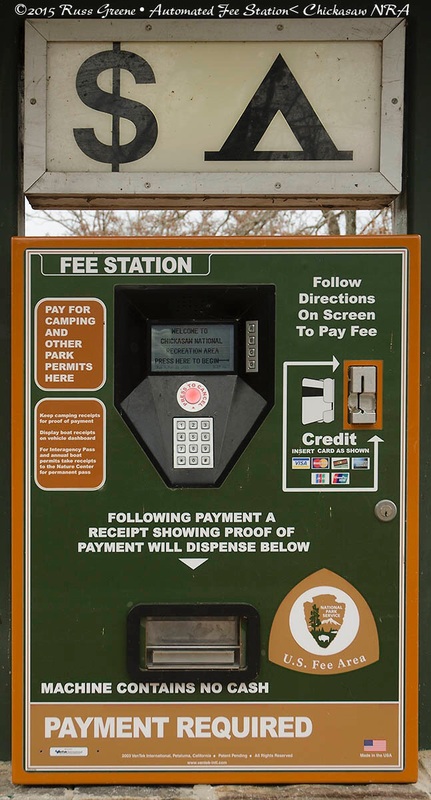 When I reserved a site via recreation.gov there was no reservation fee (some campgrounds do not have reservation fees imposed). RESERVATIONS ACCEPTED: Yes, at least for some sites. It seemed as if Loop D may be first come first served because there was a self pay credit card machine at the entry whereas Loop C had no self pay station which seemed to indicate the loop consisted or reservable sites. Check with recreation.gov. ACCESS: Roads to and in the campground are asphalt, but within the campground the roads are narrow. HANDICAP ACCESSIBILITY: Yes. Phone or check the web site for details. Note: As I have seen numerous times before, when there is a decent data signal without the booster download speeds are slower with it and upload speeds are faster with it. Along Blue Cedar Rd. near Buckhorn Campground I saw quite a few variants of the marriage of RV and more permeant structures such as porches and houses. 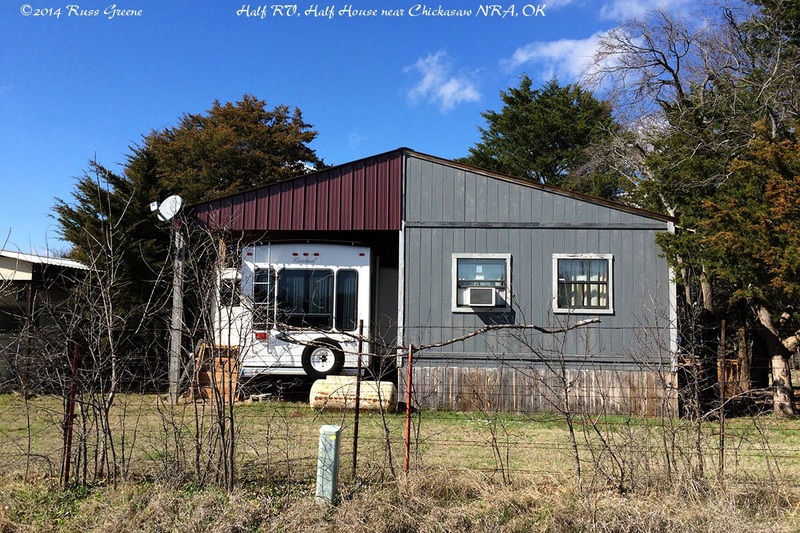 Here, an RV has a shelter built over it which is attached to the house (mobile home?) and the slide on the right appears tone incorporated into the house although I couldn’t tell for certain. 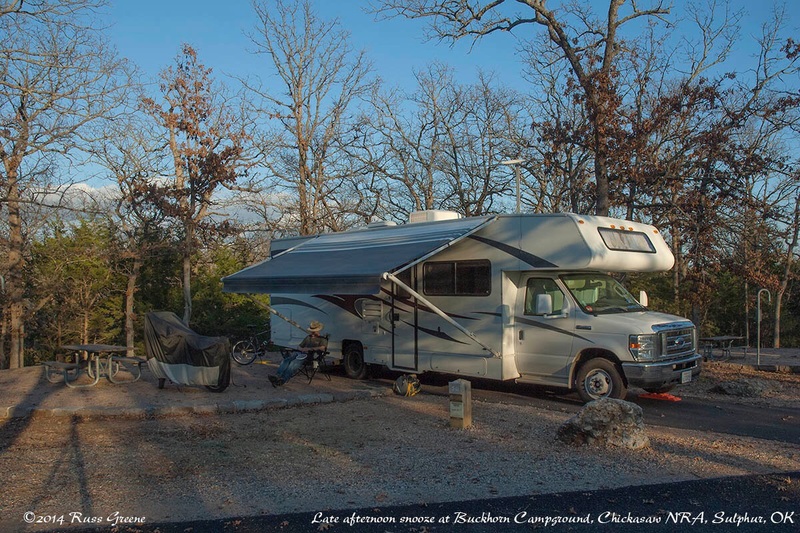 When I arrived at the Buckhorn Campground it was at the very beginning of spring but some of the trees were still dropping the previous fall’s brown leaves and there wasn’t yet much sense, if any, of spring having arrived. The campground is well wooded and I can see that when the trees fill up with the new leaves of spring and summer it will make for quite a lovely environment. I chose to stop here because Oklahoma was on the list of states I needed to visit in order to visit all 50, it was on my way to the southeast, it’s more natural setting than private RV parks, and with a Senior Pass was but $12 a night including water, electricity and showers. The timing of my arrival, March, was still early enough in the year so as not to be overly concerned about tornados–being overly concerned is something at which I excel. The average number of twisters in OK in March is 5. In April it jumps to 11 and in May the average is 28 before tapering off in June to 7. This data is based on 1991 thru 2010. If I’m not mistaken the campground was constructed by the CCC back in the 1930s. This would explain the size of the campsites which is small by today’s standards. 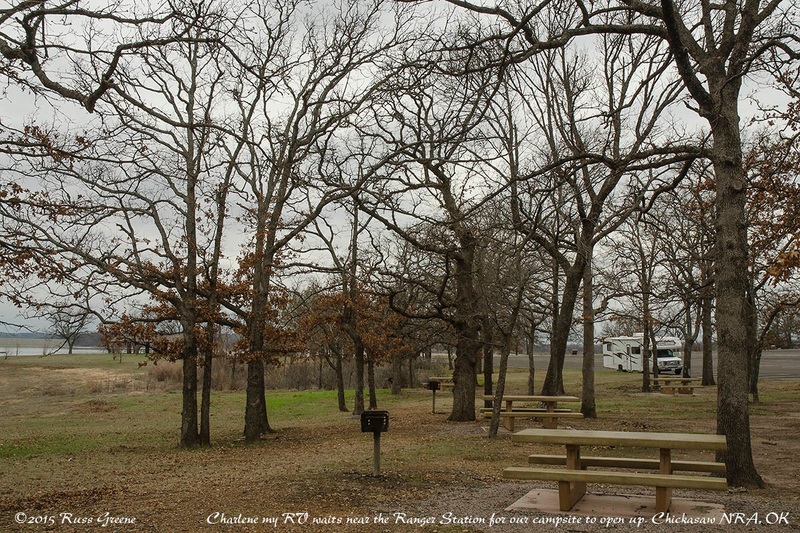 All told, there are 6 campgrounds within the Chickasaw NRA. Lake of the Arbuckles where the Buckhorn Campground is situated is a man made reservoir. People boat, fish and swim at the lake. The Wikipedia page with the lake’s history is here. http://en.m.wikipedia.org/wiki/Lake_of_the_Arbuckles Buckhorn is near the southern end of the NRA on the east shore of the lake. Several multi-use trails are near Buckhorn for hiking, bicycling and horseback riding. Wildlife in the area includes: deer, bobcat, coyote, turkey, beaver, armadillo, hawks and owls, quail, roadrunner, rattlesnake, tarantula, scorpion and others. Climate; Summers are hot and humid, winters mild which may explain last year’s leaves still on the trees; thunderstorms are common April thru July. My first day at Buckhorn saw gray and gloomy weather and it rained all night. The next day the sun came out and I went for a bicycle ride from the campground up Blue Cedar Road to where it intersects 177, about an 11 mile round trip with a few long hills but nothing that forced me to dismount. There was little traffic. I passed a private RV/mobile home park. They had shelters under which some of the RVs were parked. Some had porches attached to them. At least one was attached to a mobile home. The Buckhorn Cemetary is situated where Cedar Blue and 177 meet. It’s no more than a field with small number of headstones, some unmarked. I stopped to wander about. 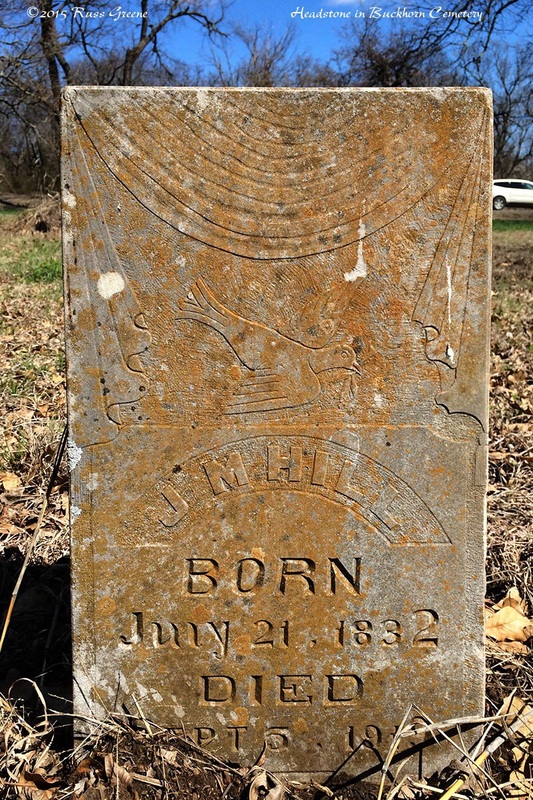 At least one of the headstones dated back almost 200 years, to the 1830s. I felt sad for the people buried there, that they had to die. I cried a little for them and then rode my bicycle home. good, that is progress! Still up or already up? This is where I went to HS in SC. How does it feel, I wonder in 2015? modern, backward, traditional? Bon continuation de voyage! You should visit again to see what you think. When I was in the area a local instructed me to pronounce Ouchita as wash-i-ta. Have you found anyone saying it like that? Yes. I found a recording on YouTube which was much like that. As I recall the accent was on the first syllable. Thanks. Nice to be able to follow your travels more closely- I found an old road map of the US and followed your itinerary yesterday since you mentioned the towns where you stopped. You have covered a lot of territory, but with reasonably spaced stops. Good planning! Charlene seems to fit in quite comfortably into the background with the roof extention pulled out-makes it feel immediately homey and comfy for a mid afternoon nap. I have never seen this state, nor Tennessee, but hear that there are nice things to see. Lots of history in these states. I do know the deep South, having spent 3 of my high school years there. I remember having fun, but was deeply affected by the cruelty of racism and unequality I witnessed at that time. I hear that things have changed and that my old HS is now finally integrated! You will have learned so many new things about the old US when you have finished your tour! I’ve covered even more territroy now. I’m near Heavener, OK, in the Ouchita National Forest. I’m not sure how it’s pronounced but I think it may be Oh-cheetah with the accent on the first syllable. I think I’m narroly escaping some intense thunderstorm cells–golfball size hail has been reported nearby, just to the northeast of my location. i heard the forecast yesterday and planned this camping location becasue it looked heavily forested in satellite pics. I thought I might get some protection from tree cover. None of the campsites really offer that, however, so my fingers have been crossed while I watch the radar images. The “roof extension” to which you refer is an awning.